New Year’s inspires a lot of talk about new ideas, plans, and aspirations, but what about old things? Our house is built out of mostly re-claimed materials, giving new use to old objects. Looking around my studio, you can see quite a bit of reusing, reducing, and recycling going on! Today I wanted to share a few of my favorite new/old combinations. 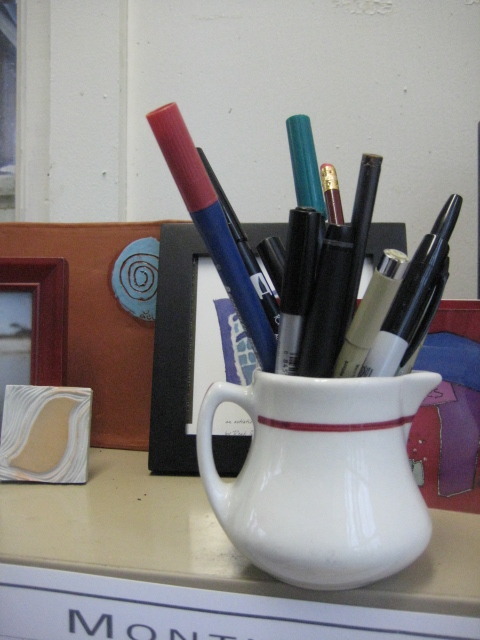 A lot of people use pretty old cups and vases for pencil jars. I do too! I also use thrift store finds that might not otherwise get a lot of use, like this small pitcher, and cleaned-out food packaging that I find useful or pleasing to the eye, like these old gelato containers. 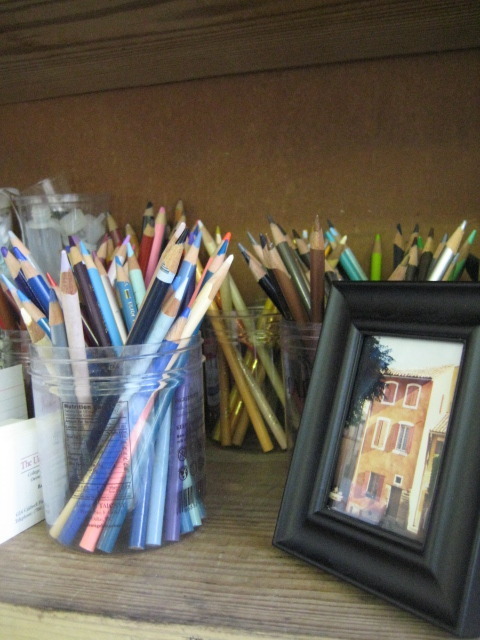 What do you use as containers in your home? The shelf that I keep my supplies on was made out of heart pine planking from an old house. It has such a pleasant patina, a nice reminder of how much it’s been through its long life. Using this shelf is such a different experience from that of using the hand-me-down Ikea bookshelf in my closet. Both have their benefits, of course, but I love the character found in this shelf that my husband built for me with reclaimed wood. This beautiful file cabinet was already down the stairs and out the door of my downtown studio building before I caught up with the cute boys carrying it. I ran after them, yelling ‘Wait, Wait! 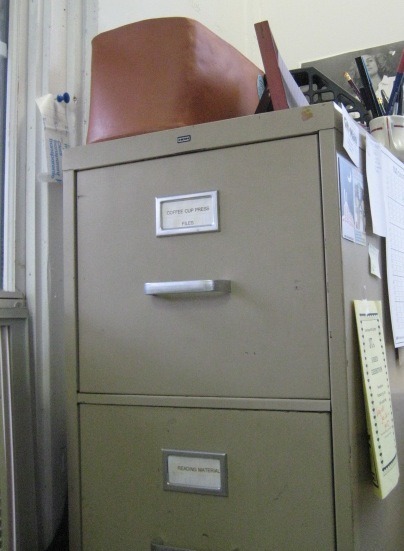 - Are you throwing that away?” I snagged this perfectly functional, very sturdy file cabinet that someone was just going to toss in the trash! It found its way into my studio, with the idea that it would corral the paperwork that seems to spread everywhere overnight. I try to remember that I can add file folders and papers to it in addition to the slides and disks and that I keep in there now! 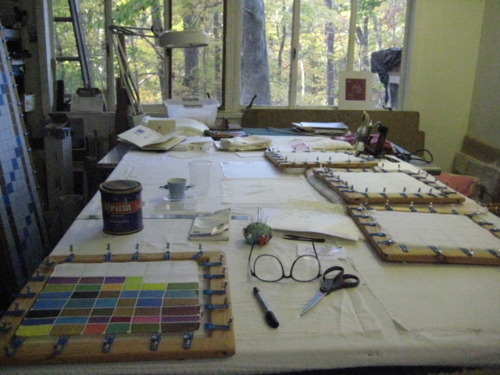 My work table is one of my favorite pieces in my studio. The bottom section supported a food prep table that was used in this space before I moved in. Luckily, it wasn’t too difficult for Harvey to add my work surface to the base of the food prep table! It has the added benefit of being the perfect height for me to work on while standing. As I considered moving into my current small studio space, the one thing that was non-negotiable was the size of the tabletop work surface. I have to have a 4’x8’ surface! For too many years I worked on multiple smaller tables, in spaces that were much too cramped. Now that I have this 4’x8’ table, though, I find myself dreaming of someday having two tables to work on simultaneously! This cute little table was made out of an old shelf and scrap white pine lumber. Originally, Harvey made it to use while camping at the beach. It was a perfect size and weight to throw on top of the car and set up next to the campfire for dinner and a bottle of wine. 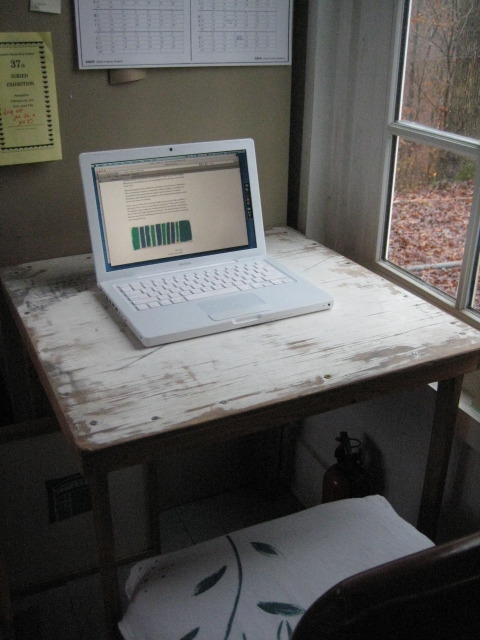 When we returned home, I realized the table was the perfect height for typing (accidentally ergonomically correct!) while sitting on our kitchen chairs. It made me realize that our kitchen table is a little too high for me to use for typing - this was much more comfortable, so I adopted it for my studio! I’ve been having a lot of fun looking over the Design*Sponge at Home book this week. I love it that others are even more creative with their reusing, reducing, and recycling than I am - repurposing items found on the sidewalks of Brooklyn or the thrift stores of Athens. And somehow, they make it look completely put together and intentional! It makes me view my studio with new eyes. Tell me, what neat re-use ideas have you had lately?